I seem to have the same kind of news each time I come back after the Christmas New Year break. Fires, heavy rains, closures. And no different this year. Black Hill was hit pretty hard by fires in early January. I have left it up to Steven Wilson (who is the club’s eyes and ears of all things Black Hill) to give you a rundown on the area and you can get a good idea just by looking at the photos. The post following this report contains Steven’s report. There are more on the clubs photo site so check these out also. Current situation is that Black Hill is closed. I plan to be in contact with Macedon Ranges city council to chat further on reopenings and how we might help out. Following the fires, we received some much welcomed rain. As often happens, these rains were quite heavy and impacted on a number of roads and areas in the Grampians. Due to it’s fragile state, some parts of the North Grampians suffered a little more from the rain with washouts. Summerday Valley had a couple of sections of track blow out. A part of the new access track in took a blow. This was a section of the track that was being monitored already because of erosion. This will need to be assessed as to whether it can be rebuilt or the track needs to be slightly realigned. Hardest hit in the valley though was the access track around to Main Wall. This small track followed closely to the creek and unfortunately when the heavy rains hit, the creek rose and completely washed out the track. This again will need to be assessed as to the best course of action. 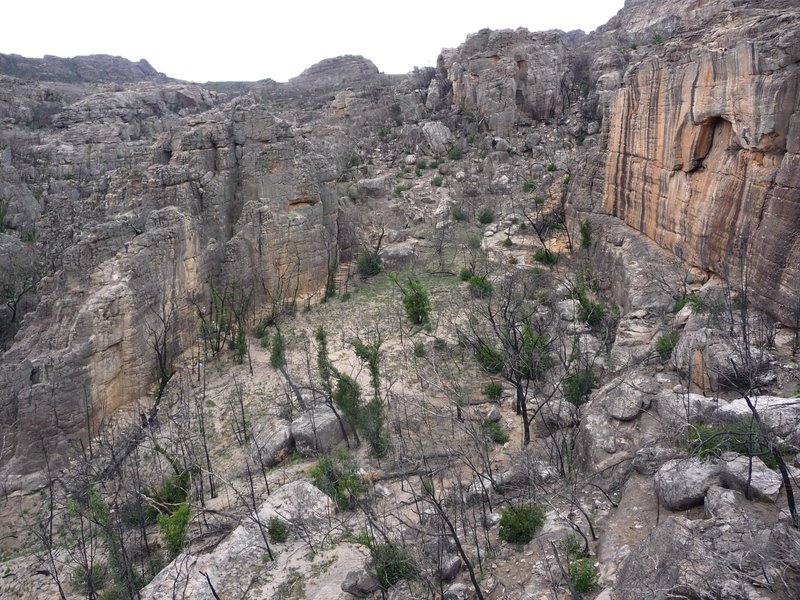 There has been some confusion over a number of climbing areas in the Northern Grampians as to whether they are open or not, such as the Ravine and other crags along the Pohlner Road. Also the Asses Ears. By default, these areas no longer fall into the closed and no access category, as the roads have now been opened. As there are no real visitor sites in these areas, the concern of human traffic is not so high but this doesn’t take away from the fact that the areas are still really fragile. After having conversations with the PV team at Halls Gap, it is worth noting that giving these areas a wide berth for a while yet would be the right and sustainable thing to do. Many of our climbing areas are not official visitor sites. This means that they are not always included in every single communication so it gets a bit difficult sometimes to ensure that climbers are not putting these areas at risk from further damage. This is something that will definitely be a future discussion with PV. The term ‘sustainable climbing’ is something that all climbers need to take on board and understand that because many of the areas in which we climb are not always an ‘official visitor site’, we need to take some responsibility for doing the right thing, thereby ensuring that any environmental damage is limited. Take a closer look at some of these areas if you are visiting them and make the call yourself. Is there limited vegetated ground cover? Loose soil? No distinguishing original tracks meaning new ones (and often, less sustainable ones) appearing. Multiple tracks. These things are noticeable if you actually look for them rather than just making a beeline to the cliff to climb. The other concern that isn’t so noticeable in the early days, is the transporting of outside weeds and pathogens into a fragile and bare area that has little or no natural vegetation system happening. With no other plant life competing with them, weed seeds and pathogens can take hold and forever alter the environment in which native flora used to thrive. For many people, maybe these things aren’t really a concern, but I would hope that many of the things that you love about the Australian bush is the flora and fauna. Would be a shame to see this diminish over time. This entry was posted in Access &Environment officer reports, black hill, Grampians, Parks Victoria updates & info and tagged access report, black hill, black range, Bushfires, cliffcare, closures, grampians, hollow mountain, Mt Talbot by Tracey. Bookmark the permalink.